You may remember last month I was inspired by Marlo to embark upon the exciting adventure of unraveling thrift store sweaters for yarn. Today, Ro joined the Crochet Blogs ring. 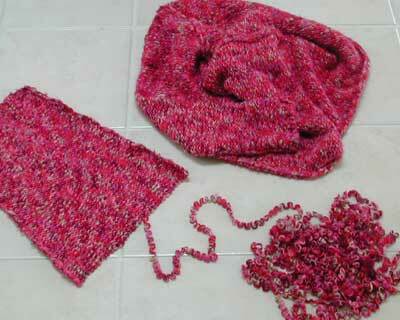 She has just unraveled her first sweater and, in her new crochet blog, posted this great link: How to Unravel a Sweater. Here are pics of my first unraveling experience. I feel like I’ve unlocked a secret stash of yarn ripe for the picking. 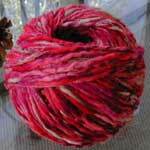 Lucious, unattainable, unaffordable yarns can now be mine! I am giddy with glee! This is a Gap girls XXL sweater (97% acrylic, 3% other fibers), which cost me $2.59 at Goodwill. The yarn turned out to be three strands. 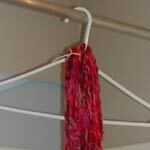 One strand was thick and thin yarn in red, pink, purple, and pale green. And the other two were thin twists of white and glittery purple string. The sweater was machine washable and dryable, so I did both before starting. First sleeve unraveled and yarn tied into a hank. Washing the hank to help get rid of the curliness. For this, I followed the instructions from Reusing Yarn. Hanging the damp hank with a weight on the bottom to get out the curliness. (The weight is a metal stand you use to roast a chicken on the outdoor grill. I know, I know, but it was the first thing I found!) 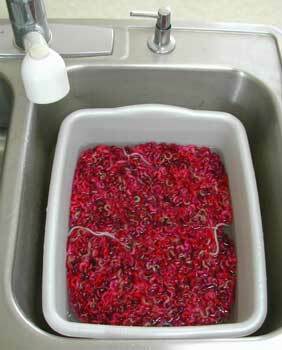 In hindsight, it wasn’t necessary to wash the hank, because this type of yarn wasn’t affected much by the curliness. 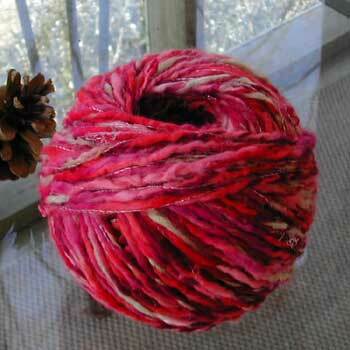 My first ball of yarn from the sweater, washed, dried, and wound into a center-pull ball. To wind the yarn, I followed the instructions at Reusing Yarn. Later on, I found similar, more detailed instructions at Yarn Balls. 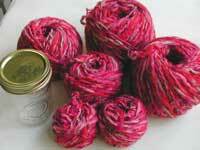 All of the balls of yarn from the sweater, with a wide-mouth pint canning jar thrown in for scale. (Do I live in the South?) 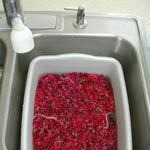 After the first ball, I stopped the washing and weighted drying of the hanks. This thick and thin yarn straightened out well enough on its own after being wound into balls. Update, May 4, 2004: Here’s my first FO with this yarn, a sweet little jar. 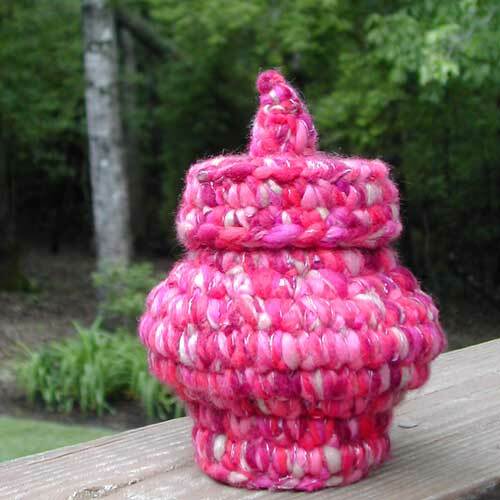 Pattern: Prayer Pot by Marlo. Aaaak! Your yarn looks fabulous! What a find and how exciting. I am off in search of good deals tomorrow ~ being inspired by you!!! Think of the posibilities… right now I see an awesome shawl. Cool. I’ll try that someday! Hey Donna! Thanks for my very first blog link. I sat here and followed all the additional link you posted and am so glad you did. That sweater sleeve is so full of curls now I know how to straighten it out a bit. Thank goddess I have the day off today as soon as I get the kiddies out the door for school I am off to hank my hanks!..lol almost sounds indecent hehehe then I am going to dig out a toilet paper tube from the bathroom trash can and give this yarn the nice ball shape it deserves. hey thanks for showing us that unraveling sweaters is actually worthwhile! by the way — did you check out the neau knits couple? how cute are they?? I unraveled my first sweater last night (pics up soon) and decided to wind the yarn directly from the sweater to a ball. 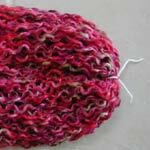 After thinking about it, and then knitting a sample, I may not wash or stretch it. The kinks seemed to straighten as I wound the the ball. Does anyone else wash the sweater, and then skip washing the yarn before using it? PS… thanks for the lovely links! Thank you for the great infos! :) I think I am inspired. 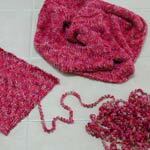 Unraveling sweaters for rare yarn… What an idea! Love the colors in your sweater. Thanks so much for sharing the info. 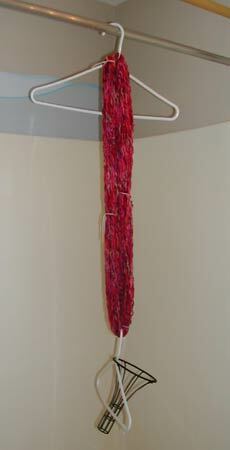 I have been unraveling yarn for a while now.It is such a frugal way to get yarn this way. I thought I was the only one who did this. thats interesting.what kind of sweaters can you rip?Any kind or does it have to be homemade>I wouldn’t mind trying this.btw..I would love to take a sheepie home to my new pad if sheepie doesn’t mind going to a new home? This is very interesting. I learn so much from reading blogs. Very pretty! What are you going to make with it? Wow! I am impressed and inspired! There must be a trip to a local thrift shop this weekend, see if I can find any sweaters to unravel! Thanks for all the great links and pictures of your experience! I don’t know if anyone else could find the unraveling instructions but I couldn’t.